This is indirect method of testing d.c. motors in which flux remains practically constant i.e. specially in case of shunt and compound motors. Without actually loading the motor the losses and hence efficiency at different loads can be found out. The motor is run on no load at its rated voltage. At the starting some resistance is connected in series with the armature which is cut when motor attains sufficient speed. Now the speed of the motor is adjusted to the rated speed with the help of shunt field rheostat as shown in the Fig. 1. 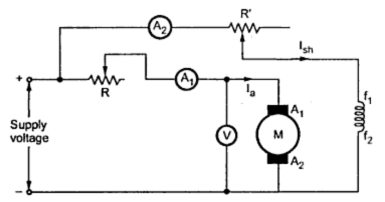 The no load armature current Ia is measured by ammeter A1 whereas the shunt current is measured by ammeter A2. In the field and armature windings there will be copper loss due to flow of current which will increase the temperature of the field and armature winding when the motor is loaded. This increase in temperature will affect their resistance. Thus the new value of field resistance R'sh and that of armature R'a can be found by considering that rise in temperature as about 40 oC. 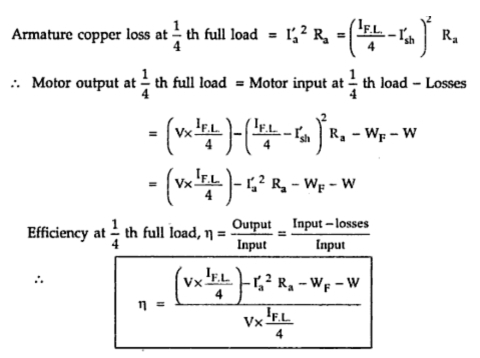 ... Motor input at 1/4 th full load = V x ( IF.L./4) watts. This is the efficiency of motor when the load on motor is 1/4 th of full load which can be found without loading the motor. The efficiencies at other loads can be calculated similarly. 1. Since constant losses are known, the efficiency can be estimated at any load. 2. The method is convenient and economical as less power is required for testing even a large motor i.e. only no load power is to be supplied. 3. The motor is not required to be loaded i.e. only test to be carried out is the no load test. 1. In this method, the iron losses are assumed to be constant which is not the true case a sthey change from no load to full load. Due to armature reaction at full load there will be distortion in flux which will increase the iron loass. 2. The only test which is carried out is the no load test. Hence it is difficult to know whether there will be satisfactory communication at full load. 3. We have assumed that there is rise in temperature of 40 oC at full load which can not be checked actually as we are not actually loading the motor. 4. As it is a no load test it can not be performed on a series motor.